It’s no exaggeration to say that Henderson’s is an Edinburgh institution. The UK’s longest running vegetarian restaurant, it’s been serving customers in Edinburgh since 1962. It has a few restaurants in the city now, but the original salad table, located under their deli shop on the city’s Hanover Street was where I chose to meet a friend the other day. I have fond memories of this place. As an adolescent vegetarian it was invaluable and I spent many a happy hour in here chatting to my Mum or gossiping with friends. The layout has changed little and it still has a casual, welcoming atmosphere. There’s a section slightly further downstairs that has live music most nights and is available for hire, but we ate in the main part. The place has an informal, friendly feel and you simply choose what you’d like from the chalk board, the staff hands it over, then you pop it on a tray and pay – easy. The restaurant is fully vegetarian and the vegan options are clearly marked with a ‘V’. They also indicate whether dishes contain nuts or are gluten free, so ‘special’ diets are catered for in abundance. The vegan options are clearly marked. We both ended up choosing the vegan pizza with salad, which was lovely. The large array of salads is tempting, and the staff more than happy to confirm which ones are vegan friendly. There’s a tempting array of salads. I had a gorgeous bean sprout, tofu and ginger salad with mine and polished it all off with ease! To wash it down, I had a Black Isle lager, which I’d checked was vegan friendly. It’s a great place to hang out as there are lots of tables, so we chatted away for quite a while longer, not feeling rushed or ‘in the way’, as you can in some places. After a while we both decided to indulge in a dessert. There was a big choice of desserts. There was a good choice for vegans, so I went for the chocolate cake with coconut cream on the side (soya cream was also available.) It was incredibly rich and very enjoyable. They have a great variety of soft drinks too, so I had an elderflower flavoured one, which was just the thing. You gotta love the fact they have vegan donuts! Henderson’s have a totally vegan restaurant as well which is just around the corner and they also have a new restaurant in Holyrood near the Scottish Parliament. I’ll be reviewing these soon I hope! A great place just for a coffee too. So, if you’re after a chilled out place to meet with friends or just pop in to take a break from shopping or sightseeing, this is a great bet. Henderson’s also do outside catering too, so if you’re planning a party, give them a call. I hope you find the time to relax at the salad table soon. Branches of Zizzi can be found all over the UK and it’s great to see a chain restaurant making the effort to cater to vegans. They now have a specific vegan menu which you can ask for on arrival and although having a basic pasta with tomato sauce is a tad uninspiring (even though you can add extra veg to it) it’s when you get to the pizzas that the real excitement starts. Zizzi use a vegan cheese made from rice milk called Mozzarisella which I really like. It’s gooey and melty and really adds to the pizza experience. You can of course ask for veggie pizzas without cheese as Zizzi’s standard pizza bases are vegan already. We went for the vegan garlic bread (they also do a bruschetta) and when it came it was enormous! Laid out on a big slab, you could really see the cloves of roasted garlic and sprigs of rosemary which made it extremely appetising. It was very tasty and perfect for sharing around. All their vegan dishes come with a little ‘vegan’ sticker on the side, which is a reassuring measure to eliminate confusion. We ordered a basic pizza with different ‘create your own’ toppings. You can choose from: artichokes; butternut squash; caramelised balsamic onions; roasted garlic cloves; fire roasted red peppers; field mushrooms; black olives; green chillies; balsamic tomatoes; roasted red onions; spinach. (A more limited version of this list is what’s available to pop into your pasta.) I went for caramelised balsamic onions and mushrooms. The onions had quite a strong flavour and added a certain zing. My companion went for peppers, mushrooms and artichoke. The variety of toppings makes for (almost) endless combinations. After the huge garlic bread and the pizza, we were too full to manage dessert on this occasion. Yes, that’s right, they have vegan dessert! Not only one, but a choice of three. OK, two of them are sorbet (lemon or strawberry), but one isn’t! The third option is a coconut and mango swirl gelato and I tried this on another visit to Zizzi. (The picture isn’t so great, but it gives you an idea…) I must say I was impressed with the taste. I love a bit of coconut and this was as satisfying as any gelato, vegan or otherwise, that I’ve had. It was the perfect cooling experience after I’d added a bit of chilli oil to my pizza! Yes, we took some garlic bread home in a doggy bag! I find it enormously encouraging that more and more chain restaurants like Zizzi are recognising the importance of catering for everyone. It’s getting easier and easier to eat out as a vegan and surely we’re entering some kind of ‘golden age.’ It’s never been more convenient to be a vegan, so if you have someone in your life who’s interested in this cruelty-free lifestyle, send them to this website. Now you can add Zizzi to your ‘stress free places to dine’ list! Hurray! So, stomach rumbling, I was passing the chain pubs and restaurants where the best I could hope for was a disappointing salad, when I happened across No 1 Harbourside, which not only had vegan options as part of its main menu, but vegan beer too! I’d hit the jackpot. The picnic-style benches outside had all different decorations, one with chess boards and snakes and ladders, another with some kind of emperor in glorious robes. The huge indoor space was welcoming, despite its size and had plenty of interesting decor to gaze at while waiting on your food to arrive. A sizeable collection of books was in one corner, striped pillars and fun blackboards elsewhere. One of the blackboards outlined the restaurant’s commitment to sourcing produce locally and even had a map drawn out. The bar area itself seemed packed with liquid options and inviting bar stools were there for anyone just popping in for a quick drink. Particularly luxurious for me were the beers and ales on tap that specified quite clearly that they were vegan, and they were all from different breweries too. No more guesswork as you hesitate to give a local brewery beer a try. The ‘Spun Gold’ and ‘Funky Monkey’ caught my eye, but I could not go past trying the ‘Why Kick a Moo Cow’ pale ale, as I have family connections to New Zealand. It was a cloudy, pleasant ale that I happily sat on for an hour or so. In each category of food there seemed to be at least one gluten free choice as well, so I was impressed that they seemed to be catering to a wide range of culinary requirements. Vegan options when I was there included: Lentil and quinoa BB ‘meatballs’ on toasted ciabatta, sweet miso slaw, Severn project salad; Farinata, carrots with cashew dip, pickled vegetables, hummus and fava tagine; Spiced potato fruit and nut brik pastry, dukkah salad, rhubarb and beetroot chutney and (what I ordered) Orzo pasta salad, summer radish, red onion and chilli, pesto and nut crumble. I also ordered a side of Jersey royal potatoes which, although they came with butter on the menu, were very easily veganised, with no fuss. I absolutely adored the food. Every mouthful was bursting with flavour. With vegans having to compromise so much when eating out sometimes, this was a blissful experience. I devoured the lot, which is not to say I didn’t savour it. With no room left for a dessert, I didn’t enquire after one, so can’t tell you if there were vegan options there too. The staff were very friendly but left me alone to read and eat and just generally take the place in. They have lots more information on their website and up to date menus can be found on their facebook page. Follow No 1 Harbourside on twitter here. 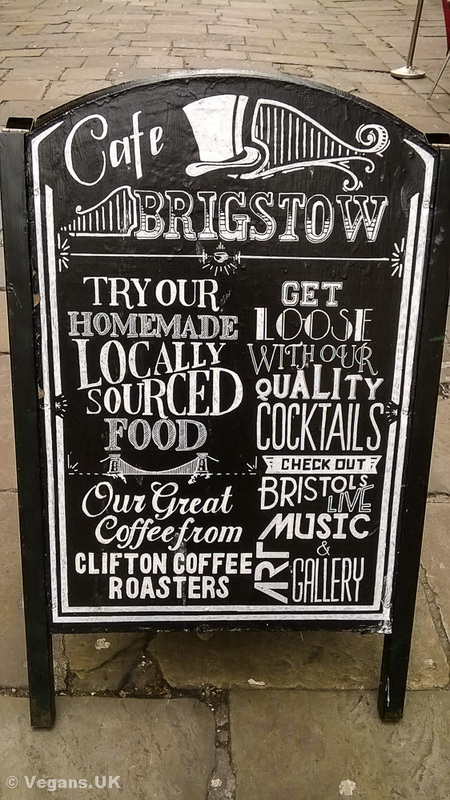 I stumbled across The Brigstow on Clare Street in central Bristol while I was out looking for a vegan feed the day before VegFest. I’d arrived from London at 2pm and was in the mood for a late lunch. It looks like an ordinary pub from the outside, but once you cross the threshold it is an altogether more bohemian and therefore interesting establishment. I was greeted by an incredibly chipper bloke behind the bar who was very helpful. Despite its mostly meaty menu of burgers and sliders (am I the only one who finds the word ‘slider’ less than appetising? Just me then…) there were a couple of vegan options. Once I’d placed my order and was cosy at my rickety table, the staff were attentive but not overly so. The chef even poked his head out of the kitchen and asked if I’d prefer hummus to their normal mayonnaise, to which I enthusiastically nodded my ascent. I chose the falafel burger and fries, which, in a manner I fear would disgust the plate society, or whatever they call themselves, was served on a plank of wood. The chips were in a poke, as Scots of the past would say, and the whole thing was totally yummy. Instead of coleslaw they’d made up some onion salsa kind of stuff (I’m afraid I’ve forgotten exactly what it was called) but it was a triumph. All in all a very pleasant experience and a positive note on which to start my culinary experience of Bristol. I’d dined at the Bread Street Brasserie before on a weeknight, as they always have vegan options on their regular menu, but tonight was busier as it was their monthly vegan evening. The high ceilings and beautiful light fittings made for a lovely ambiance. The restaurant is attached to the Hilton hotel and very centrally located. We met friends there who are new to Edinburgh and, although not vegan themselves, were keen to try out the special menu. Between us we sampled almost everything on offer. We were served bread with vegan butter and as soon as one of our friends asserted that she was gluten free, some gf bread was produced with a flourish. The entire menu on this particular evening was gluten free, so there was a brilliant range of options not only for vegans and the lactose intolerant, but for celiacs too. To start I had the lightly charred asparagus spears and, although somewhat minimalist, it was a tasty appetiser with a lovely sesame dressing. My fellow diners were equally impressed with both the nettle and spinach soup (which we nicknamed ‘spiky soup’) and the watercress, orange and avocado salad. The soup was a brave choice for one who had only been stung by nettles while out running and never eaten the things. It was a pleasant surprise to find out they were not just for assaulting one’s knees when out wearing shorts, but could be harvested to be made into something pretty yummy. Our friends both opted for the red lentil and spring vegetable-stuffed roast peppers for their main, while my other half chose the leek and chestnut mushroom pie. 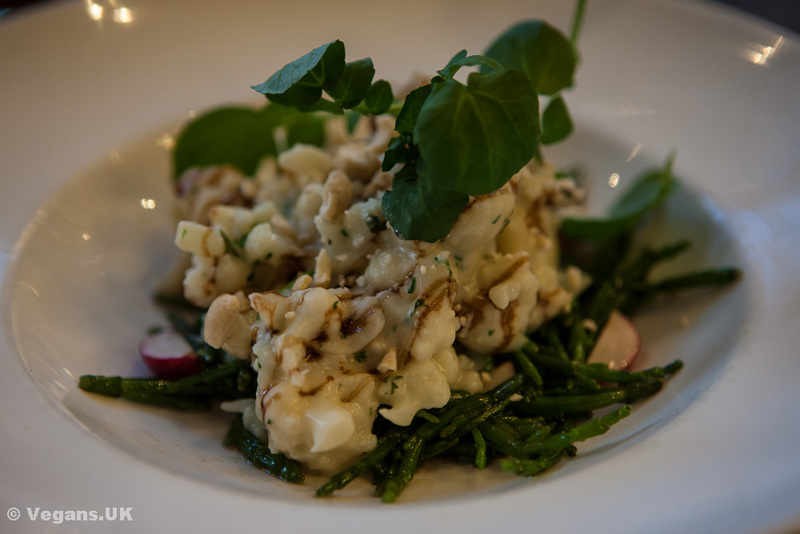 I picked the steamed cauliflower with cashew ‘cheese’ sauce as, not only do I think the cauliflower is a much maligned vegetable and demand needs to be encouraged, but I’m a sucker for cheese fakery. I wasn’t disappointed. Cries of ‘yum’ emanated from our table, not least from me. The portions were delicate, but the taste was fantastic. Each plate of food was beautifully presented and at £17.50 for three courses, I’d say it was a bargain. The dreadful news came as we were about to order our desserts. They had run out of chocolate nut lava cake. What to do? It had been so popular that we were just too late to sample any. Still, with two other options, all seemed well. My hubby went for the tangy rhubarb sorbet. 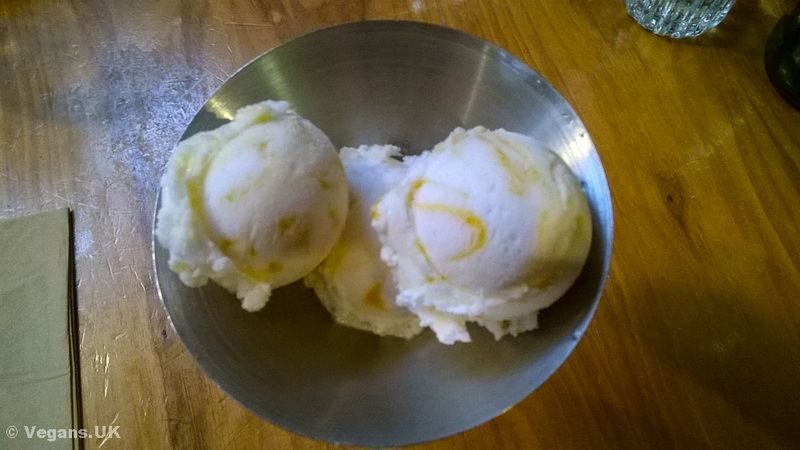 I don’t know about you, but when I imagine sorbet, I think of a somewhat icy, bitter experience unless you’re somewhere that specialises in desserts, and even then it often has to be loaded with fruit to save it from being really boring. Well, the Bread Street Brasserie just tore up the rule book. It was the creamy, sweet, flavourful dessert that vegans so often have to miss out on, and the portion was generous. Myself and the others decided to be even more adventurous and try the quinoa and banana pudding. I’ll be honest, I’d never have though to put quinoa in a pudding and I was somewhat apprehensive. But do you know what? It worked. It really worked and all three of us tucked in with gusto. In the end we were all almost glad the chocolate cake was missing, as it would have stopped our voyage of very pleasant discovery. If you’d like to attend the Bread Street Brasserie’s next vegan evening, check them out on social media, or visit their website.